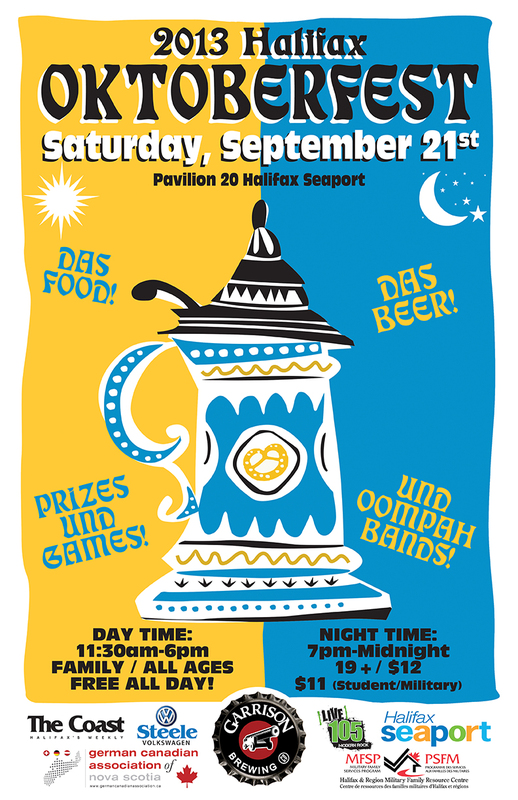 This year’s Halifax Oktoberfest, presented by The German Canadian Association of Nova Scotia and Garrison Brewing, is being held this Saturday at Pier 20, from 11:30-midnight. The event has two distinct parts: until 6pm, the grounds are open to public of ages, with no ticket required; after 7pm, the gates open back up and entrance is ages 19+, with tickets $12 at the door. So, most importantly, what’s the beer situation going to be? In addition to Garrison’s flagship beers, they will be serving their new Harvest Wheat, an unfiltered American Wheat beer, from 2-Row Maritime Malt, Wheat, Munich and CaraPils, and hopped with Hallertauer. It clocks in at 4.6% ABV and 13 IBUs and should complement the food quite nicely. There will also be a couple of special firkins, including one tapped at noon by Counselor Waye Mason (representing the mayor), to start the festivities. Just like at Wiesn! In addition to the beer, ShipBuilders Cider will be available on tap. What would Oktoberfest be without great German food? There will be weiner schnitzel, bratwurst, german pastries (including Lebkuchenherz), and both roast pig and a 150lb smoked pig raised at Meander River Farm. Geir Simensen and his team from Saege Bistro and Scanway Catering will be running the show, so the food will be excellent and authentic. During the day, there will be games (for young and old), dancing thanks to Polka/Oompah musicians Die Brewmasters & Die Holzhacker Bub’n, and a couple of car-centric events running until 4pm: a German Auto Show with over 30 new and collector cars and British Automotive Touring Association’s Live Drive, where you can tour around town for a donation to ALS research. In the evening, there will be lots more beer and food and fun, and the music will be provided by The Roving Steins and Hawco. The Halifax Oktoberfest is a fundraiser for the Halifax & Region Military Family Resource Centre & The German Canadian Association. Throughout the day, there will be draws for prizes donated from local businesses.